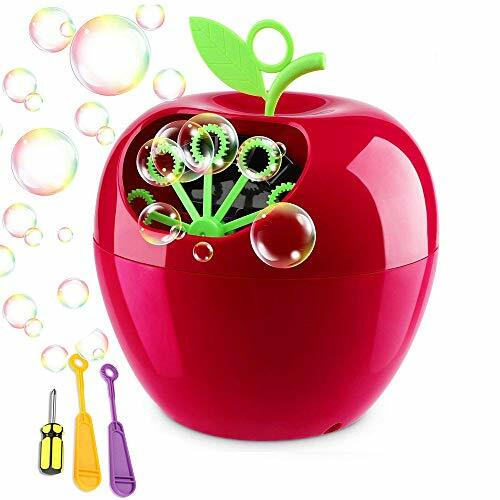 ❤ Huge Output & New Design: This Apple-shaped kids Bubble Machine can blow up to 800 bubbles per minute by its powerful motor and spanning wands [The real output depends on heat, humidity, quality of solution and so on] . ❤ Indoor & Outdoor Use: Create interesting and romantic effects for birthday parties, stages, weddings, discos, baby showers or take it outdoors for anything from picnics to pool parties. ❤ Portable & Easy to Use & Clean: Made of light and durable material. Convenient to turn on or off by just one button. The reservoir only needs basic cleaning after using. ❤Safe Material & Ideal Gift: Made of non-toxic and superior ABS plastic. Safe, durable and best Birthday or Christmas gift toys for your cute children. ❤ Battery Powered Bubbles: Uses 4 x AA batteries (batteries not included) Light weight portable. If you have any issues after buying YIHUNION products. You can directly contact us via Amazon E-Mail. We will be here for you to solve your any questions.